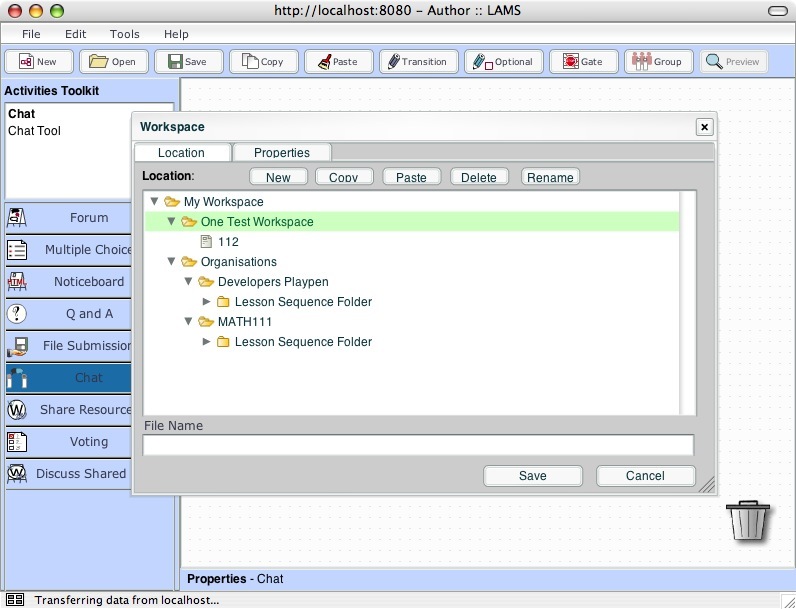 LAMS 2.0 was released in December 2006. 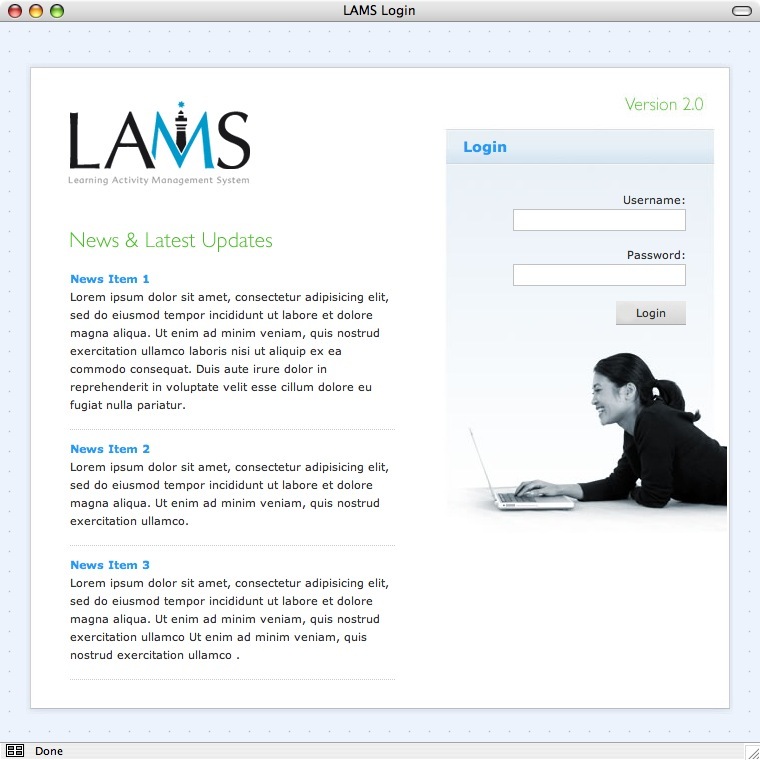 The current release is LAMS 2.2 (Dec 5, 2008). See latest development status for general information on the next release release. See Animated Tutorials for demonstration. 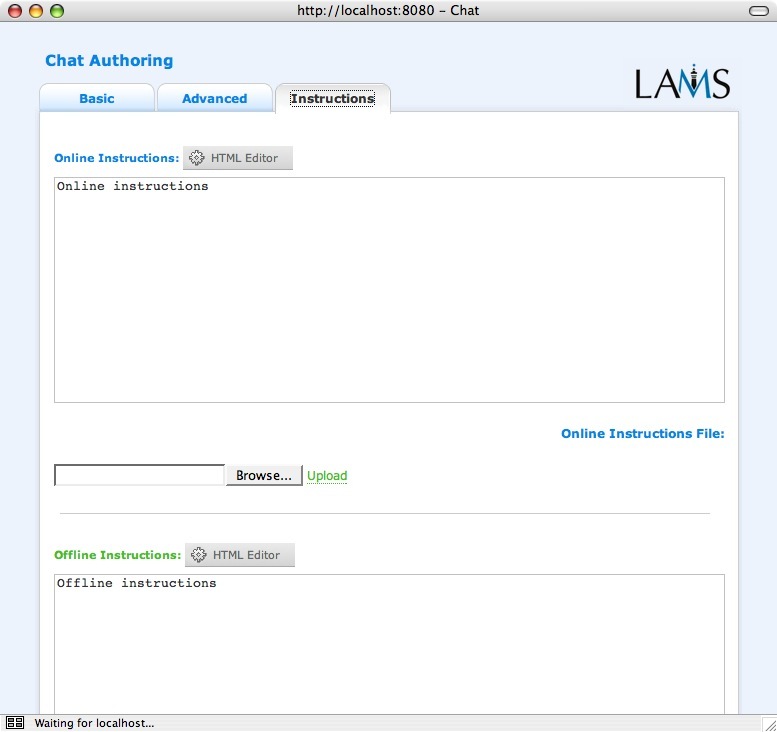 Also you can sign up for a demo account at the LAMS Demo server. 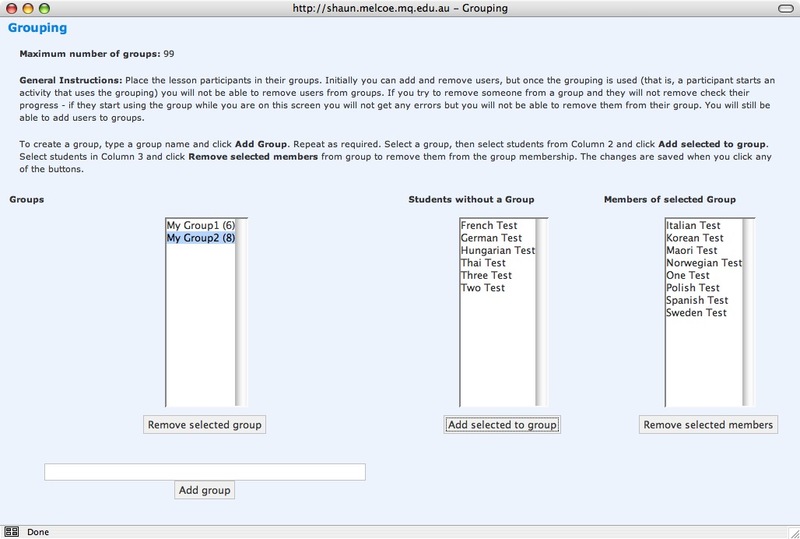 * Or do it your way: you manually set the groups and the students in each group. Remember how annoying it was to assign a sequence to a class? Well, now we have a Lesson Wizard to do this in four clicks! 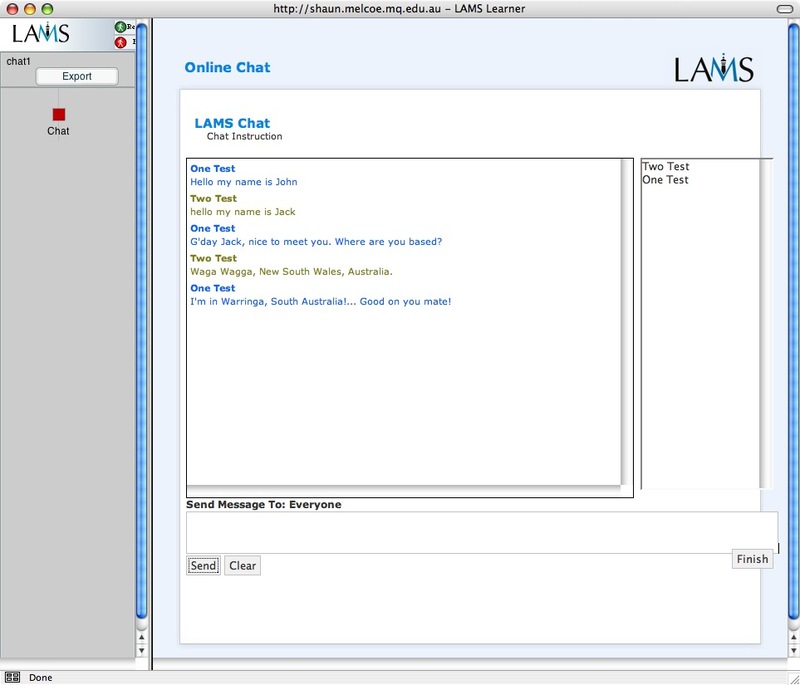 LAMS is now skinnable, so you can create your own look and feel. The default look and feel, however, looks much nicer now! 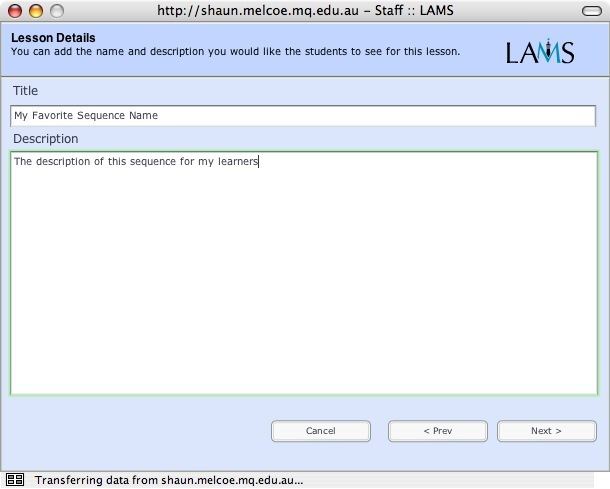 This system module provides the interface for author sequences and teachers to create sequences of activities and set their parameters. Authors are allowed to open existent sequences that are stored in their own folders and/or public and departmental folders. If the sequence is not owned by the opening author and has licensing information, a popup message should be display informing about the licensing and enforcing if the sequence cannot be modified. When editing an existing sequence, revert changes will undo all alterations and regress to the latest save version. Closes the sequence that is being authored. 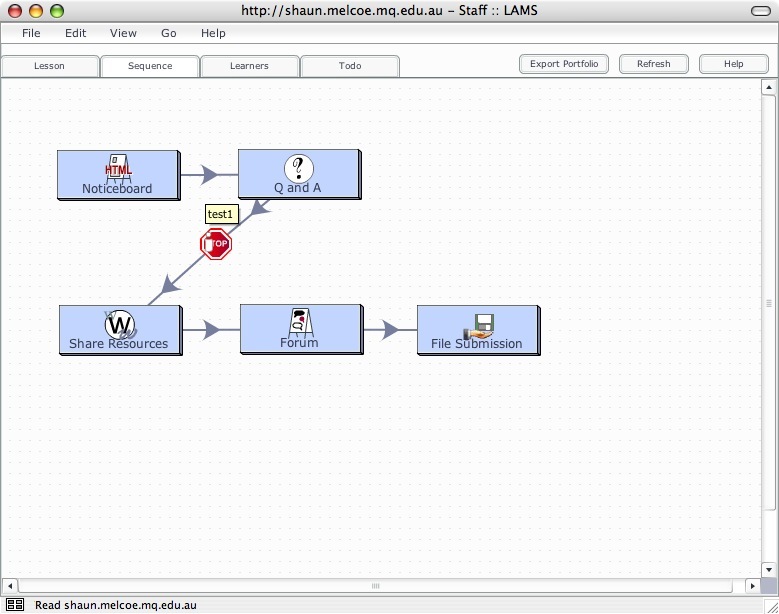 Saves a sequence to LAMS internal folder/structure system. The author gets to choose the sequence?s name and the save area where the sequence will be saved to. In the Save screen, there?s a button that allows the author to edit sequence properties and metadata. While authoring an existing sequence, the author can choose this option to save the sequence under a different name. 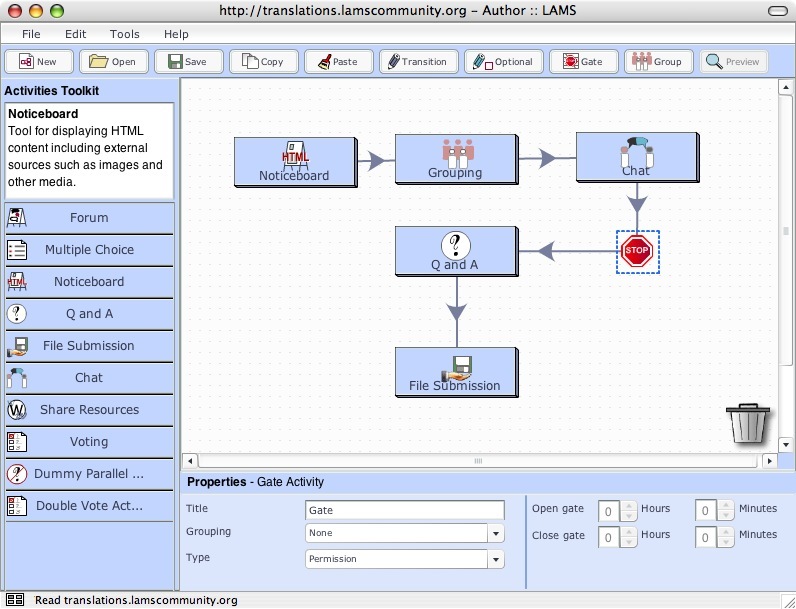 Imports a LAMS sequence and its attached files and resources that were previously exported either from previous or current versions (in LAMS LD). The importing process should also verify the existence of all pertinent tools to run the sequence. 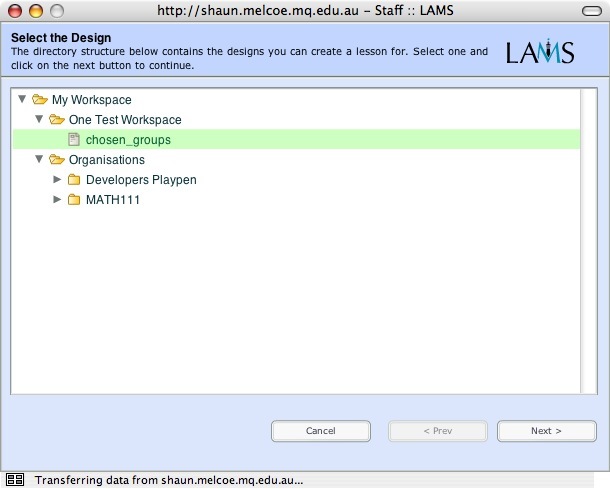 In case a particular tool does not exist in this LAMS installation the user should be notified and provided with possible solutions. Additionally, information regarding Sequence licensing must be presented to the user that is importing the sequence. Given a selected activity, the author can choose to copy the activity to later on paste it. These options are represented in the screen as two separate buttons. Given a set of activities (not yet connected thru transitions) an author can click on the "Optional" button and draw a square/rectangle over these activites to set them all as part of a bigger optional activity that contains them. All activities covered by the surface of the drawn rectangle are part of this optional activity. The author sets the title, instructions and the minimum number of activities that the student has to complete before he finishes this optional activity. The author is able to draw a line (transition) between two different activities. These transitions can be set (optional) to be use gates to set time release or "Wait for staff release", which will set a sync point for student before they get to the next transition. The author has the ability to view how the sequence is rendered to students. By clicking on the "Create" button, the author is presented with all the folders and storing sequence areas he has access to, to select a sequence. Once the sequence is selected, the user then assigns it to an existing class. 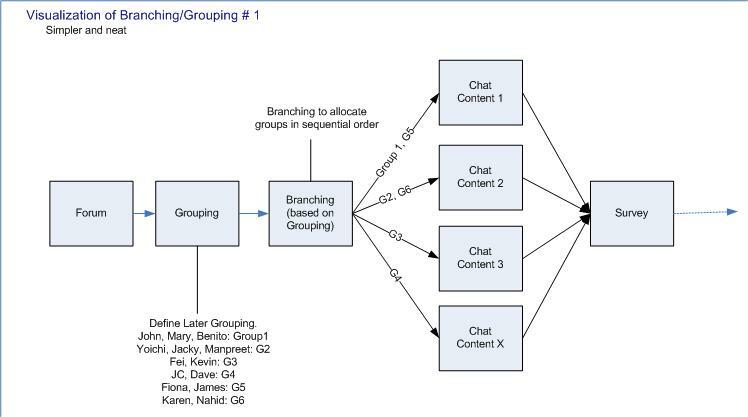 If the sequence contains group activities that are meant to be set at "runtime", the teacher is prompt to set the groups based on the current students in the class. If activities have been set to be defined later (or in Monitor) a notification of the these will be presented so the teacher can take appropiate action and complete the content for the activities. View student's comments share with the teacher. If a lesson is enabled, then the label for this button is "Disabled". When clicked, the lesson is taken out as an option of available sequences for the selected class. If a lesson is disabled, then the "Enable" label is displayed. When clicked, the sequence is available to students in the selected class. 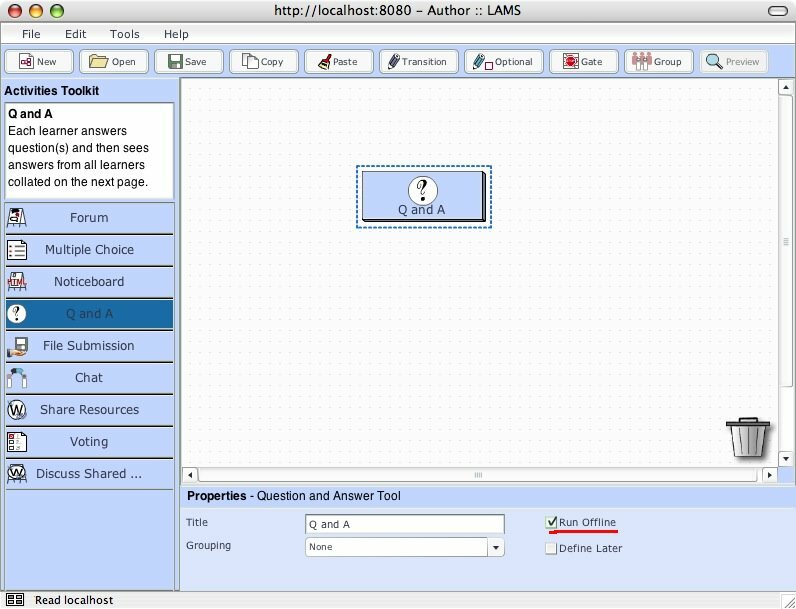 If a lessson class has been started, this option allows the user to view the students and the grouping within that lesson. This view displays the sequence as it was designed by the author. If the user double clicks on an activity, the Force Complete option will force all the students within this session class that have not yet reached or passed that activity to continue from that activity onwards. Prints all the instructions and contributions for the entire class in a sequence. This tab displays the process path of all students that have started the sequence. 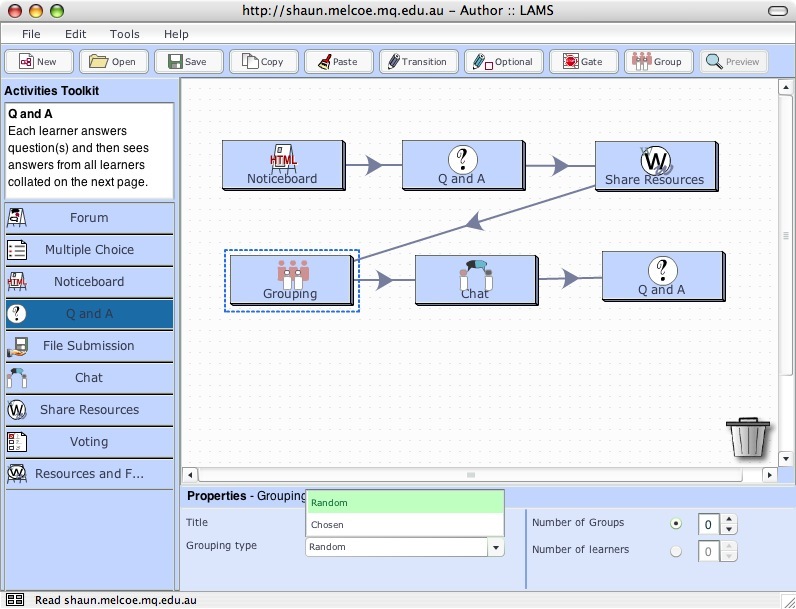 Each student is represented as a row displaying a linear representation of the sequence, each activity represented as a dot (node) in a line and indicating in different colours (or shapes) the student?s location with the sequence. The user can double click on each node or dot to view the student?s contribution to a given activity. 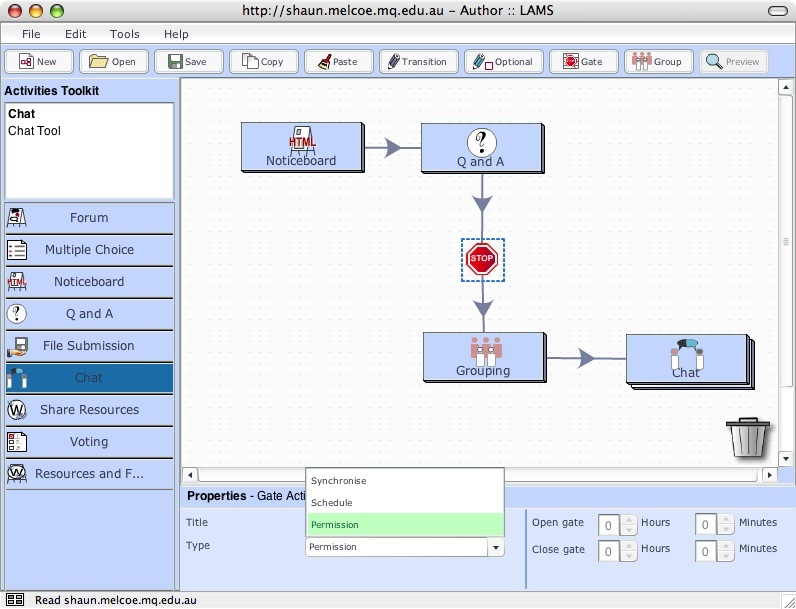 If the student has not yet reached that given node, then a popup window stating this accordingly is displayed. When viewing the contribution of a student, the user has an option to hide any given contribution to an activity by that student. Prints all the instructions and contributions for a specified student in a sequence. This section covers all the user management functionalities including external authentication. Allows the administrator to set up the appropriate authentication schema. 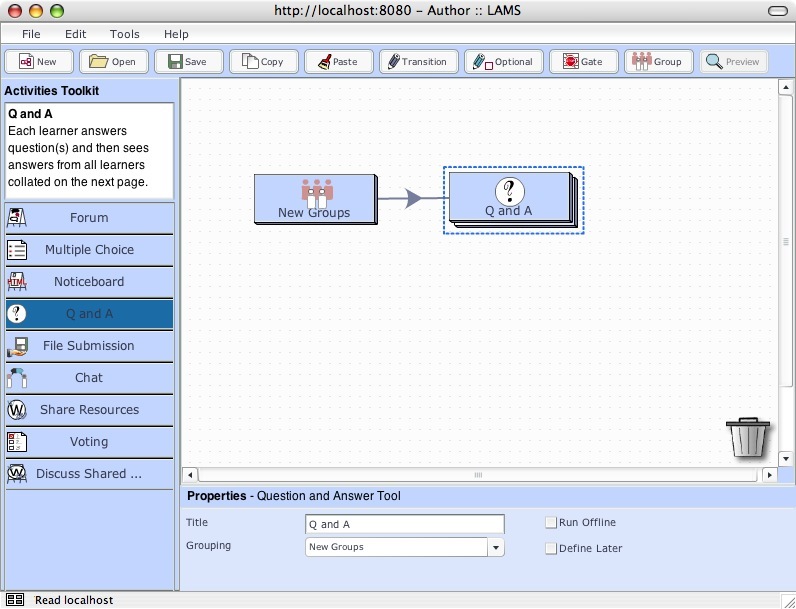 Installs a new LAMS tool. 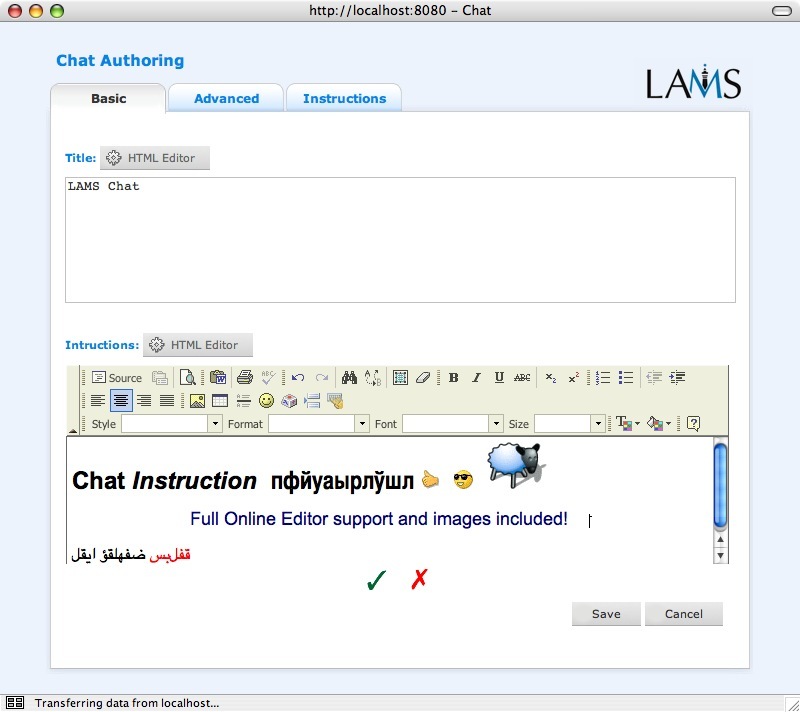 Presents information regarding tools' output, input, MD, version, signature, licensing. Simple automated assessment questions, including multiple choice and true/false. Poses question to learners and recieves written response. Compares Learner responses with peers. Allows submission of files through Learner interface for later viewing/download via the monitoring environment. Collates Learner responses to questions then collates and displays results as numerical data. 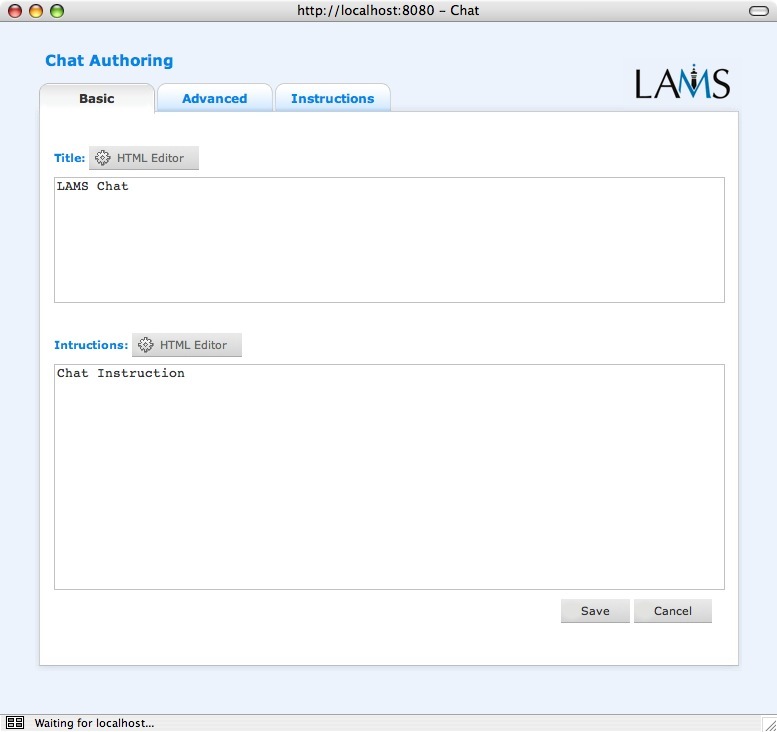 This tool is the template to create LAMS composite activities (Chat& Scribe, Q&A & Journal, Resources & Forum, Voting + Journal). It allows you to combine activities into one activity aggregate. Add URLs, single files, entire websites of IMS Content packages and they will play automatically for the students. Allows single or multiple response from predefined list to a particular question. The good old Resource (on the top frame) and Forum (bottom frame) activity that allows learners to discuss (via de forum) the resources available is now the first parallel activity implemented using the parallel activity template!